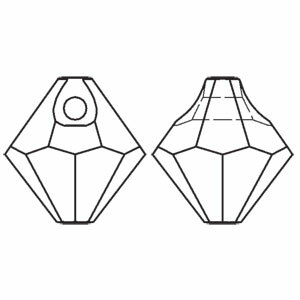 Swarovski 6301 Top Drilled Bicone is often classified as a pendant. But it is so much more in its applications, than a pendant. It can be interchangeably used as pendants, drops or charms, and as interspacing drop bead between other crystals or pearls. Often used to create unforgettable ensembles in necklaces, bracelets, and earrings. It offers the timeless versatility of the classic bicone bead with the additional twist of having it top-drilled.